On the 4th June at 1100 hours, Anthony Leighs and his Crusader35 crew will be on the start line for the 22nd Royal Akarana Yacht Club offshore race to Fiji. Leighs, with crew members Josh Tucker, Chris Maddock, Brett Elliott, Nick Bastow and James Glidden have some unfinished business to attend to. In the 2014 Crusader35 was just 200 nautical miles into ANZ Sail Fiji when they were forced to make an emergency u-turn and head to Opua. Crusader35 sustained damage to the keel hydraulics and were not able to continue the race. “We made it safety to Opua and as you can imagine, were devastated with what had happened,” said Leighs. “ANZ Sail Fiji was out first serious offshore race for the boat. 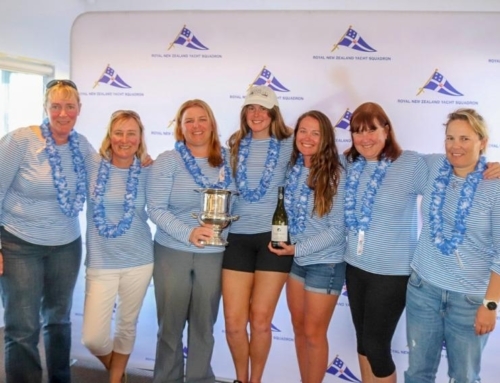 We had some great success in the 2012 Coastal Classic setting a new record for monohulls under 40ft and at 2013 Bay of Islands Sailing Week we won our division. So for us to experience the issue with the keel 200nm offshore was a major blow,” continued Leighs. When the crew were sitting on the boat in Opua, Josh Tucker made the suggestion “let’s go to New Caledonia for the Groupama Race.” Since then, Crusader 35 hasn’t looked back. “We got the boat fixed and headed to Noumea for the Groupama Race in September 2014,” said Leighs. “This was the start of the next chapter for us as a team. We set a new race record of 3 days 18 hours 54 minutes and 6 seconds, the race was epic,” continued Leighs. 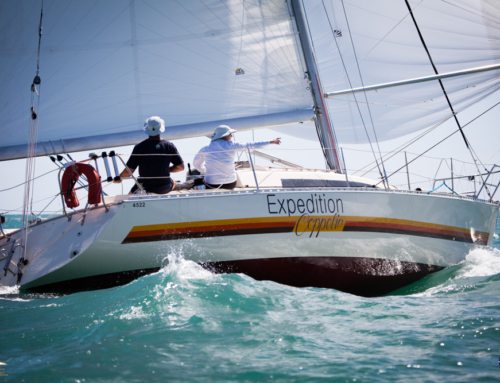 Since then Crusader35 has raced in numerous events including the 2015 Transpac. Drama hit again just before their start when the crew had to deal with a broken carbon forestay and damaged bowsprit to replace. “We had a bit on before the Transpac! Unfortunately the bowsprit wasn’t able to retract and affected our upwind performance. A huge power cut to most of Long Beach made life even harder with limited shops and services open for the pre-race preparation and no internet or charging for our navigation and weather updates. We also had zero power coming to our hotel which resulted in us packing our bags under torchlight,” said Leighs. Crusader35 finished 6th in their division and received the trophy for the fastest boat under 36ft leaving the crew hungry for more. Other successes include the 2014 Auckland Tauranga, 2014 Cook Straight Classic and 2015 Central Triangle all won on both line and corrected time. The crew on board are rock solid. Having done thousands of miles together, their bond is one that won’t be broken. “We have a great bunch of guys on board and are able to seamlessly work together. We have “Booboo” aka Josh Tucker on main, Nick Bastow on bow, Chris Maddock navigating us, James Glidden trimming, Brett Elliott who looks after us as an all rounder and myself on the helm. Being able to do these races with your mates makes it so much better,” said Leighs. As Crusader35 lines up for the start of ANZ Sail Fiji, they will be hoping to add this race to their bucket list. Rivals on the water are Anarchy (YD37), Blink (Shaw 12) and the Class 40 Evolution Sails Hupane. “We are only 35 foot, but have plenty of grunt. We are hoping for a close race, but there are 1,100 nautical miles to cover. Anything can happen,” said Leighs. ANZ Sail Fiji starts on Saturday 4th June at 1100 hours. To date there are 16 entrants in the race including two multihulls and two cruising boats. The best vantage points to watch the start will be North Head, Bastian Point, Orakei Wharf and be actually being on the water.